Amsterdam-based Victoria Davies and Elena Vyaznikova are the first ever flute and harp duo to be booked by music @ stansted. Something of an oversight, perhaps, given the popularity of this delightful combination! 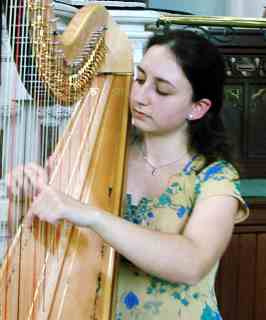 Victoria studied harp as a postgraduate at the Royal Academy of Music, before which she read music at Christ Church, Oxford, and she is now an experienced solo and orchestral harpist. In October 2000 and 2001 she won the London Harp Competition, in January 2001 received a Jellinek Award, and was a national semi-finalist and London Region Winner in the 2002 BBC Young Musicians Competition. Concerto appearances including Handel and Boïeldieu Harp Concertos and the Mozart Flute and Harp Concerto with Guildford Symphony Orchestra, Surrey Mozart Players, Welwyn Garden City Orchestra and the Charterhouse Orchestra. She performed at the 5th European Harp Symposium in Amsterdam (2001), at World Harp Congresses in Prague (1999) and Geneva (2002), and at Buckingham Palace (2002), and at the Foreign Office in 2000, accompanying José Cura and Kathryn Harries at the BT Voices for Hospices Concert. In December 2002, she performed Britten’s Ceremony of Carols with Christ Church Cathedral Choir at St. John’s Smith Square, London, and with whom she has recorded the work. Victoria was previously a music scholar at Charterhouse, studied at the Royal College of Music Junior Department with Daphne Boden, and was Principal Harp in the National Youth Orchestra. She holds ABRSM performance diplomas on harp and on piano, and now studies harp with Skaila Kanga. She plays regularly in Oxford with Mimi Amici, the chamber ensemble she founded in 2001. Elena began her flute studies at 11 years old at the Ippolitov-Ivanov Music College under Sergei Bubnov (solo flautist Russian National Orchestra), from where she graduated with the highest distinction and continued her studies with Professor Alexander Korneev in Moscow. She subsequently studied at the Royal Conservatory of The Hague and Sweelinck Conservatorium in Amsterdam in The Netherlands with Kersten McCall (Royal Concertgebouw Orchestra) and Harrie Starreveld (Nieuw Ensemble), from where she graduated with her Master’s diploma in 2011. Elena has successfully competed in national and international competitions, most recently in the Benelux Competition in 2010, where she was placed in the top finalists amongst participants from across Belgium, Luxembourg and The Netherlands. She has frequently performed in international festivals, such as the Darmstadt Festival 2010 in Germany, the Caudeamus Muziekweek, the Dag in de Branding, the Kamermuziek in het Groen in Holland, and the New Works Music Festival at Southampton University in the UK. She has performed regularly with International Contemporary Music Group Modelo62 and Trio Papyan, with whom she won a ‘Stichting Muziek in Huis’ award, which enabled them to perform in 40 different venues across the country and in venues such as the Russian Embassy and the Hermitage Museum in Amsterdam. 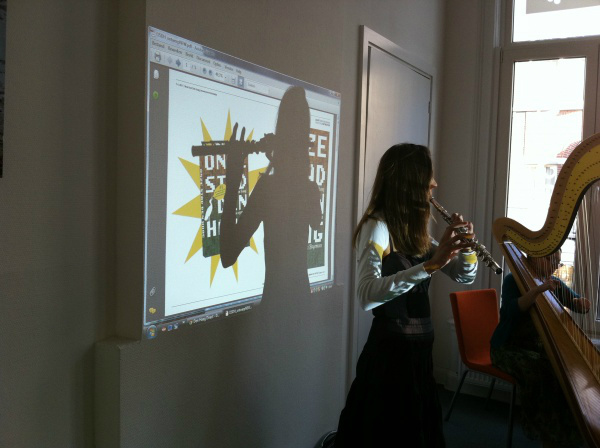 She recently became a flautist of The Bach Orchestra of The Netherlands.